Firstly, yes, "Prometheus" is a prequel to "Alien." 20th Century Fox played coy with the pre-release details for a reason, hoping that they could create generous buzz and a bit of mystery surrounding a sensitive production. Unfortunately, it wasn't an especially satisfying prequel to "Alien," doing away with the original's sense of terror and exposure focusing more on crude violence and spotty philosophy. While the return of director Ridley Scott to the franchise he originally shaped should have been cause for celebration, the master visualist couldn't find a perfect posture for material that teases the good stuff and embellishes the routine. In the future, archaeologist Elizabeth Shaw (Noomi Rapace) and lover Charlie Holloway (Logan Marshall-Green) have discovered a series of star maps left behind by an alien race who may have originated human life, pointing to a location in the far reaches of the universe. 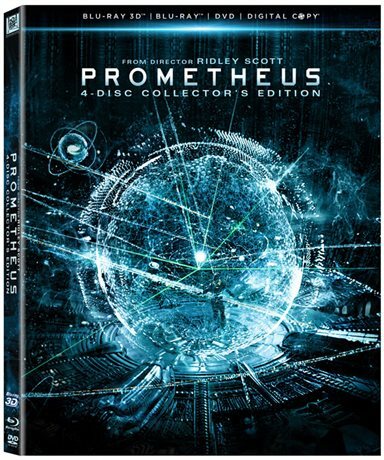 With the launch of the spaceship Prometheus under Captain Janek (Idris Elba), Shaw and Holloway are off to find the source of life on an alien moon, joined by a crew of geology and biology experts (Rafe Spall and Sean Harris), android David (Michael Fassbender), and frosty Weyland Corporation rep, Meredith Vickers (Charlize Theron). Once landed, the crew discovers a temple of mysterious creatures and malicious liquid, requiring intense study back on the Prometheus. However, this doomed scientific/spiritual mission doesn't go as planned, with Shaw gradually understanding the enormity of her discoveries and their catastrophic potential. We've come a long way since the release of 1979's "Alien," which spawned three sequels and two abysmal spinoff's, leaving little direction for a new adventure to take. With prequels the trend, prequels it is, though "Prometheus" makes very careful interpretive moves early on, going to distance itself from the franchise. Gone is the threat of a goopy, acid-blooded invader, replaced with a provocative question of creation, built within a clunky script by Damon Lindelof and Jon Spaihts. Indeed, "Prometheus" examines the origins of life on Earth, using a cryptic plan of DNA born from an ivory-skinned, oversized "engineer" as a starter pistol for this ambiguous viewing experience. Admittedly, it's a bold idea, mining the best ambitions of the genre as it questions the world around us, making the audience consider an extraterrestrial manipulation as the genesis for humanity instead of a heavenly order ruled by religion or scientific instinct. Heavy stuff, though the writing never gets past a superficial argument of evolution, refusing introductory debates to solidify the backstory early. "Prometheus" hints at a cerebral odyssey, with the character of David symbolizing another layer of godly construction intended to amplify discomfort in the room, especially when the android shows signs of malice that, strangely, nobody questions. The script teases a few analytical and emotional directions, but seems intent on replicating the "Alien" experience, following the same formula of discovery and survival as before, though this enemy isn't a familiar one. At least not yet. It's actually quite deflating to see "Prometheus" stomp inside "Alien" footprints, especially since Scott has 33 years of hindsight to work with, more than enough time to take the premise in an exciting, innovative direction. Sadly, much of the movie falls flat, with predictable beats of danger repainted with updated tech and creature design. Scott's more interested in loud sound effects this time around, not invigorating originality. Out now on Blu-ray, there are a few different versions available. A standard version on one disc, the Blu-ray version on two discs and a collector's edition with 4 discs. This review covers the last one. On disc one is the Blu-ray 3D version of the film and for those of you with the new 3D TV's you should be pleasantly surprised. On the second disc is the Blu-ray version along with some extras. Those include alternate/deleted scenes; two commentaries, one with director/producer Ridley Scott and the other with Jon Spaihts and Damon Lindelof. There is also a feature covering fake personnel files and videos of a few of the main characters. Disc 3 is a Blu-ray bonus feature disc containing a "making of" documentary, the same production files as disc 2 and a second screen app. Disc 4 has the standard version of the film as well a feature allowing the film for download onto portable media players. All together that makes for over 7 hours of extras, pretty impressive for a film that was lackluster at the box office. If nothing else, you'll get a kick out of the bonus features even if the film wasn't your cup of tea. "Prometheus" is engineered to keep the viewer questioning. To keep the "Alien" mythology fluid enough to fuel future sequels. There are few answers to the mysteries provided, and that could be appealing to certain audiences out there in the mood for a puzzle with no apparent solution. The feature is good about introducing fresh creatures and realms, but fails to wrap up the ambiguity into a measured, thoughtful whole, worth further dissection in a new round of sequels (if that day even comes). It's tough to be the lone blockbuster in the marketplace with more on its mind than a parade of explosions, but "Prometheus" doesn't offer much beyond tantalizingly brief discussions of creation and mystifying monster outbreaks. It seems Ridley Scott has already spoiled enough by returning to the realm of his finest work without a clear exit strategy. Download Prometheus from the iTunes Store in Digial HD. For more information about Prometheus visit the FlickDirect Movie Database.